We offer state-of-the-art facilities for both private study and teaching activities. You’ll have access to two translation labs that are fully equipped with around 60 workstations plus an extensive range of specialist software for translation, subtitling, and project management. There are also two interpreter training facilities (ITF) available, featuring both single and double interpreter booths. A video link between the conference suites means you can practise remote interpreting, and record the performances so you can monitor your progress. One of our ITF suites holds virtual conference interpreting classes in conjunction with DG Interpretation (DG SCIC) at the European Commission and other Universities. With remote interpreting becoming much more widespread, this will greatly improve your ability within accreditation tests for International Organisations and make you more employable. You'll have access to our online materials for translator and interpreter training. We test and integrate new technologies within our teaching, ensuring that your learning will be enhanced by the latest industry developments. We're also continually compiling and updating very large corpora of texts in digital form, enabling you to analyse source texts and produce more idiomatic translations. Our School has two dedicated study areas with around 30 workstations for research postgraduates. The Human Communications Laboratory provides support for software usability, annotation of multimodal data, recording of interviews and digital editing. 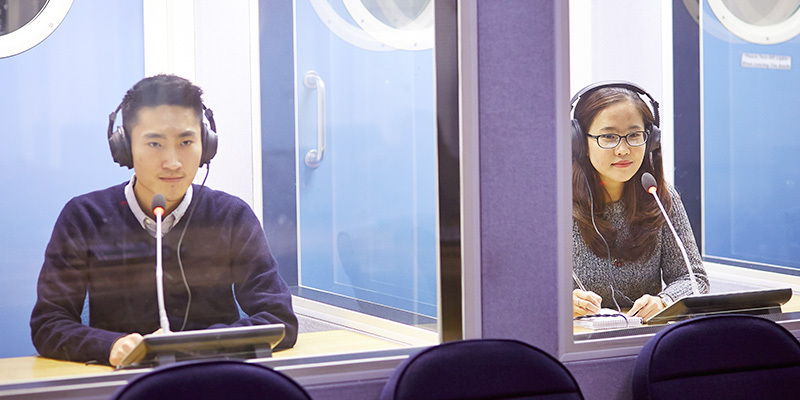 We work closely with specialists in language studies from other centres and schools, so you’ll also have access to a recording studio, a phonetics laboratory for acoustic and articulatory analysis of speech, and a linguistics laboratory with eye-tracking apparatus. You’ll also be able to use the Language Zone which is free and open to all students at the University. This has a computer cluster for personal study, books, magazines, and audio and video resources (including free access to Rosetta Stone software) to help you learn a language. There is also the University’s excellent library service that offers cutting-edge learning spaces and vast digital and print-based collections.